JetWin Sportsbook is an all-new sportsbook that popped up in early December 2013 and has remained relatively quiet on the forums but noticeable with their advertising. We decided it was time to take a look into this sportsbook and what they have to offer. On first glance of JetWin.com, we see a plain blue background, simple but not very appealing honestly. On the front page there is an advertised €100 initial deposit bonus. Wait…what? Turns out JetWin does not keep deposits in BTC, they convert your deposit to the USD value of your deposit according to Mtgox. To many people who own BTC, this is a major downside to JetWin. Most players like to keep their balances in BTC or in some balance such as USD credits (1 BTC = 1000 credits), to maintain the BTC value of their deposit. If they wanted to have a truly USD-based deposit, wouldn’t it make more sense to just deposit cash via a CASH sportsbook? Anyways, some players might like this option so we continue on with our study of the site. We decide to sign up to see what the sportsbook offerings were. When we go to the sign up page, the sportsbook asks for a lot of private information. Name, address, location, phone number and email! One of the biggest advantages that BTC owners prefer is the anonymity of gambling with BTC. This definitely was unappealing to players in our opinion. Asking for all this information was too much as there are sportsbooks who don’t even require an email address to sign up. Even worse, when looking at their bitcointalk thread, JetWin’s representative, Bookmaker, says that ID can sometimes be requested and required before a payout. This is a major red flag to us. However, they do point out that by sometimes requesting ID being provided by the player, they are trying to lessen the number of minors gambling in BTC as no other casinos seem to try and prevent minors from gambling. This is a plus but still somewhat of a red flag with the whole bitcoin goes hand and hand with privacy. We put some info in the boxes required and sign up successfully. After entering the actual casino area we realize that JetWin is simply a sportsbook, nothing else. JetWin does offer many types of wagering. They offer straight bets, parlays, over/under, handicaps, outrights and also asian handicap bets, different sports and markets. When you click on a specific wager event you want to bet on it is added to your ticket queue to the right side of your screen. Here you can place straight wagers or parlay the wagers with ease. The actual number of how many teams can be parlayed in one bet is not specified, a lack of clear rules. The max bet per straight wager varies but ranges from 500 euros to 1000 euros we determined through tinkering with sample straight bets. To make it easier to place multiple parlays for customers, JetWin offers customers the ability to place round robin wagers in addition to the simple straight and parlay wagers. 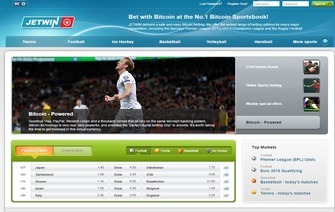 Unfortunately, JetWin does not offer any live betting options to customers. JetWin offers the most common sports: NFL, NBA, MLB, NHL, tennis and the main soccer leagues in the world. JetWin does also offer lines for smaller sports such as cricket, handball, ice hockey, basketball, volleyball, etc. JetWin offers new customers an 100% initial deposit bonus of up to $100. or equivalent in other currencies. According to the terms and conditions, the player must wager the initial deposit plus the bonus 10x before a payout can be requested. This is similar to the industry standard rollover for such a bonus. JetWin also offers reduced juice in a different way then other books for the biggest sports like NFL and NBA. They don’t have simple -107/-107 lines, they vary but they always overall are better then the spread of -110/-110. For example, one line might be -102/-115. This is 3 cents off of the standard 20 cent juice total between the two sides. However, for soccer and leagues that are not popular spreads can be as high as -120/-120 which is absurd for any sportsbook. JetWin fails to offer any bonuses or promotions currently that is unique or better then other books’ offerings. When looking at the withdraw form we notice an area where it leaves room for a lot of complaints from customers. The sportsbook notes that payouts are converted from USD or Euros back to BTC based on Mtgox rates. However, the rate used to convert back to BTC is at the company’s discretion; they use the exchange rate for BTC when they actually “process” the withdraw. This could lead to a lot of issues which honestly could be solved and avoided all together if JetWin simply kept balances in BTC and not fiat currencies. When we went to look for ways to contact JetWin we found all they had was an email for customer service. No phone number, live chat or quicker ways of communicating with the sportsbook. We decided to contact them via bitcointalk and email after our initial analysis of the site and before writing our review. After a week, we still had not received a response. This is a bad sign for the sportsbook as communication should be one of the top priorities. JetWin also is not very active on bitcointalk compared to other books and their forum representatives. Eliminate the use of converting deposits to fiat currencies. Improve communication and try to offer faster and more convenient ways to be contacted. Provide Bitcoin Casino Pro Financial security documentation. At this time JetWin has little chance of succeeding without better services and marketing. To get noticed would help them in many fashions in this highly competitive bitcoin gambling industry. Bonus Create an account, make a deposit, and you'll be awarded a match deposit bonus up to €100!